Our understanding of how forests change remains limited, due to our inability to observe them over time. In this study, Hansen et al. use satellite imagery (Landsat) to map global-scale forest cover changes from 2000 to 2012 at high spatial resolution. With this information, they determined how forests change in different countries and biomes (tropical, temperate, etc.) and were able to investigate the major causes of forest change around the world. The methods and results provided here can be used by countries and agencies that are interested in monitoring forest change for management and conservation. The Earth Engine team at Google has made data from this research paper available for use in the classroom. Google's Global Forest Change Explorer web application contains maps that are available for interactive analysis as well as an accompanying educator guide. Changes in forest cover affect the delivery of important ecosystem services, including biodiversity richness, climate regulation, carbon storage, and water supplies (1). However, spatially and temporally detailed information on global-scale forest change does not exist; previous efforts have been either sample-based or employed coarse spatial resolution data (2–4). We mapped global tree cover extent, loss, and gain for the period from 2000 to 2012 at a spatial resolution of 30 m, with loss allocated annually. Our global analysis, based on Landsat data, improves on existing knowledge of global forest extent and change by (i) being spatially explicit; (ii) quantifying gross forest loss and gain; (iii) providing annual loss information and quantifying trends in forest loss; and (iv) being derived through an internally consistent approach that is exempt from the vagaries of different definitions, methods, and data inputs. Forest loss was defined as a stand-replacement disturbance or the complete removal of tree cover canopy at the Landsat pixel scale. Forest gain was defined as the inverse of loss, or the establishment of tree canopy from a nonforest state. A total of 2.3 million km2 of forest were lost due to disturbance over the study period and 0.8 million km2 of new forest established. Of the total area of combined loss and gain (2.3 million km2 + 0.8 million km2), 0.2 million km2 of land experienced both loss and subsequent gain in forest cover during the study period. Global forest loss and gain were related to tree cover density for global climate domains, ecozones, and countries (refer to tables S1 to S3 for all data references and comparisons). Results are depicted in Fig. 1 and are viewable at full resolution at http://earthenginepartners.appspot.com/science-2013-global-forest. Fig. 1. (A) Tree cover, (B) forest loss, and (C) forest gain. A color composite of tree cover in green, forest loss in red, forest gain in blue, and forest loss and gain in magenta is shown in (D), with loss and gain enhanced for improved visualization. All map layers have been resampled for display purposes from the 30-m observation scale to a 0.05° geographic grid. Display of the distribution of tree cover around the world in 2000. The colors indicate tree cover density. 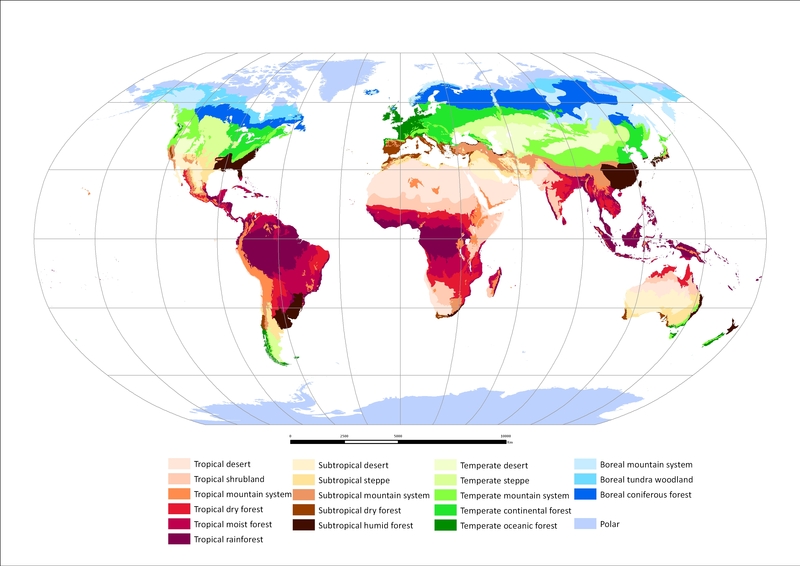 Using this map, forests can be defined as a user prefers by applying a threshold of tree cover density; for example, tree cover of more than 50% can be labeled as forest. Display of forest cover loss, defined as the complete loss of tree canopy cover regardless of density, around the world from 2000 to 2012. The color indicates how much forest was lost in a given area. Display of forest gain around the world, defined as the establishment of tree canopy cover from a state of no tree cover, from 2000 to 2012. The color indicates how much forest was regrown in a given area. Display of tree cover in green, forest loss in red, forest gain in blue, and the occurrence of both forest loss and gain in magenta from 2000 to 2012. The tropical domain experienced the greatest total forest loss and gain of the four climate domains (tropical, subtropical, temperate, and boreal), as well as the highest ratio of loss to gain (3.6 for >50% of tree cover), indicating the prevalence of deforestation dynamics. The tropics were the only domain to exhibit a statistically significant trend in annual forest loss, with an estimated increase in loss of 2101 km2/year. Tropical rainforest ecozones totaled 32% of global forest cover loss, nearly half of which occurred in South American rainforests. The tropical dry forests of South America had the highest rate of tropical forest loss, due to deforestation dynamics in the Chaco woodlands of Argentina, Paraguay (Fig. 2A), and Bolivia. Eurasian rainforests (Fig. 2B) and dense tropical dry forests of Africa and Eurasia also had high rates of loss. Fig. 2. Regional subsets of 2000 tree cover and 2000 to 2012 forest loss and gain. (A) Paraguay, centered at 21.9°S, 59.8°W; (B) Indonesia, centered at 0.4°S, 101.5°E; (C) the United States, centered at 33.8°N, 93.3°W; and (D) Russia, centered at 62.1°N, 123.4°E. A closer look at forest loss and gain in particular places around the world. Tree cover is displayed in green, forest loss in red, forest gain in blue, and the occurrence of both forest loss and gain in magenta from 2000 to 2012. A closer look at north central Paraguay (South America). This region is in the Chaco woodlands and over the study period (2000 to 2012), a large portion of the forest was lost (shown in red). There is no gain in this region, indicating a deforestation dynamic where forests are removed and replaced with another land use, such as agriculture. A closer look at West Sumatra (Indonesia), which experienced forest loss (in red), forest gain (in blue), and both forest loss and gain (magenta). From 2000 to 2012, Hansen and colleagues found that Indonesia had the largest increase in forest loss compared with all countries globally. A closer look at Arkansas (United States), which experienced forest loss with subsequent gain (in magenta) that is indicative of forestry. A closer look at east central Russia, which experienced forest loss (in red) and forest gain (in blue). The loss and gain were not in the same areas (no magenta in the figure) and differ from the other examples in shape. These shapes indicate loss of forests because of fire in red, and forest regrowth after fire in blue. Hansen and colleagues found that Russia had the most forest loss from 2000 to 2012 compared with all countries globally. Recently reported reductions in Brazilian rainforest clearing over the past decade (5) were confirmed, as annual forest loss decreased on average 1318 km2/year. However, increased annual loss of Eurasian tropical rainforest (1392 km2/year), African tropical moist deciduous forest (536 km2/year), South American dry tropical forest (459 km2/year), and Eurasian tropical moist deciduous (221 km2/year) and dry (123 km2/year) forests more than offset the slowing of Brazilian deforestation. Of all countries globally, Brazil exhibited the largest decline in annual forest loss, with a high of over 40,000 km2/year in 2003 to 2004 and a low of under 20,000 km2/year in 2010 to 2011. Of all countries globally, Indonesia exhibited the largest increase in forest loss (1021 km2/year), with a low of under 10,000 km2/year from 2000 through 2003 and a high of over 20,000 km2/year in 2011 to 2012. The converging rates of forest disturbance of Indonesia and Brazil are shown in Fig. 3. Although the short-term decline of Brazilian deforestation is well documented, changing legal frameworks governing Brazilian forests could reverse this trend (6). The effectiveness of Indonesia’s recently instituted moratorium on new licensing of concessions in primary natural forest and peatlands (7), initiated in 2011, is to be determined. Fig. 3. Annual forest loss totals for Brazil and Indonesia from 2000 to 2012. The forest loss annual increment is the slope of the estimated trend line of change in annual forest loss. Forest loss per year from 2000 to 2012 in Indonesia (left) and Brazil (right). Year is on the x-axis and forest loss in km2 per year is on the y-axis. The trend lines show the change in forest loss through time. The line is in the form y=mx+b, where m is the slope and b is the y-intercept. The slope for the change in forest cover for Indonesia is 1021 km2, which indicates that with each year, approximately 1021 km2 of forest is lost on top of the amount of forest that was lost in the previous year. Hence, the rate of forest loss is increasing with time. This line fits the data well, in that 83% of the variation in annual forest loss can be explained with the y=mx+b equation (e.g., correlation = 0.83). The slope for the change in forest cover for Brazil is -1318 km2, which indicates that with each year, approximately 1318 km2 less forest occurs compared with the amount of forest that was lost in the previous year. Hence, the rate of forest loss is decreasing with time. This line fits the data well, in that 71% of the variation in annual forest loss can be explained with the y=mx+b equation (e.g., correlation = -0.71). Subtropical forests experience extensive forestry land uses where forests are often treated as a crop and the presence of long-lived natural forests is comparatively rare (8). As a result, the highest proportional losses of forest cover and the lowest ratio of loss to gain (1.2 for >50% of tree cover) occurred in the subtropical climate domain. Aggregate forest change, or the proportion of total forest loss and gain relative to year-2000 forest area [(loss+gain)/2000 forest], equaled 16%, or more than 1% per year across all forests within the domain. Of the 10 subtropical humid and dry forest ecozones, 5 have aggregate forest change >20%, three >10%, and two >5%. North American subtropical forests of the southeastern United States are unique in terms of change dynamics because of short-cycle tree planting and harvesting (Fig. 2C). The disturbance rate of this ecozone was four times that of South American rainforests during the study period; over 31% of its forest cover was either lost or regrown. Areas of colocated loss and gain (magenta tones in Fig. 1D), indicating intensive forestry practices, are found on all continents within the subtropical climate domain, including South Africa, central Chile, southeastern Brazil, Uruguay, southern China, Australia, and New Zealand. The temperate climatic domain has a forestry-dominant change dynamic and a relatively low ratio of loss to gain (1.6 for >50% of tree cover). Oceanic ecozones, in particular, are similar to the subtropics in the intensity of indicated forest land use. The northwest United States is an area of intensive forestry, as is the entire range of temperate Canada. The intermountain West of North America exhibits a loss dynamic, largely due to fire, logging, and disease [for example, large-scale tree mortality due to mountain pine bark beetle infestation, most evident in British Colombia, Canada (9)]. Temperate Europe has a forestry dynamic with Estonia and Latvia exhibiting a high ratio of loss to gain. Portugal, which straddles the temperate and subtropical domains, has a complicated dynamic of forestry and forest loss due to fire; the resulting aggregate change dynamic is fourth in intensity globally. Elevated loss due to storm damage is indicated for a few areas. For example, a 2005 extratropical cyclone led to a historic blowdown of southern Sweden temperate forests, and a 2009 windstorm leveled extensive forest areas in southwestern France (10). Fire is the most significant cause of forest loss in boreal forests (11), and it occurred across a range of tree canopy densities. Given slower regrowth dynamics, the ratio of boreal forest loss to gain is high over the study period (2.1 for >50% of tree cover). Boreal coniferous and mountain ecozones are similar in terms of forest loss rates, with North America having a higher overall rate and Eurasia a higher absolute area of loss. Forest gain is substantial in the boreal zone, with Eurasian coniferous forests having the largest area of gain of all global ecozones during the study period, due to forestry, agricultural abandonment (12), and forest recovery after fire [as in European Russia and the Siberia region of Russia (Fig. 2D)]. Russia has the most forest loss globally. Co-located gain and loss are nearly absent in the high-latitude forests of the boreal domain, reflecting a slower regrowth dynamic in this climatic domain. Areas with loss and gain in close proximity, indicating forestry land uses, are found within nearly the entirety of Sweden and Finland, the boreal/temperate transition zone in eastern Canada, parts of European Russia, and along the Angara River in central Siberia, Russia. A goal of large-area land cover mapping is to produce globally consistent characterizations that have local relevance and utility; that is, reliable information across scales. Figure S1 reflects this capability at the national scale. Two measures of change, (i) proportion of total aggregate forest change relative to year-2000 forest area [(loss + gain)/2000 forest], shown in column q of table S3; and (ii) proportion of total change that is loss [loss/(loss + gain)], calculated from columns b and c in table S3, are displayed. The proportion of total aggregate forest change emphasizes countries with likely forestry practices by including both loss and gain in its calculation, whereas the proportion of loss to gain measure differentiates countries experiencing deforestation or another loss dynamic without a corresponding forest recovery signal. The two ratio measures normalize the forest dynamic in order to directly compare national-scale change regardless of country size or absolute area of change dynamic. In fig. S1, countries that have lost forests without gain are high on the y axis (Paraguay, Mongolia, and Zambia). Countries with a large fraction of forest area disturbed and/or reforested/afforested are high on the x axis (Swaziland, South Africa, and Uruguay). Thirty-one countries have an aggregate dynamic >1% per year, 11 have annual loss rates >1%, and 5 have annual gain rates of >1%. Figure S2 compares forest change dynamics disaggregated by ecozone (http://foris.fao.org/static/data/fra2010/ecozones2010.jpg). Brazil is a global exception in terms of forest change, with a dramatic policy-driven reduction in Amazon Basin deforestation. Although Brazilian gross forest loss is the second highest globally, other countries, including Malaysia, Cambodia, Cote d’Ivoire, Tanzania, Argentina, and Paraguay, experienced a greater percentage of loss of forest cover. Given consensus on the value of natural forests to the Earth system, Brazil’s policy intervention is an example of how awareness of forest valuation can reverse decades of previous widespread deforestation. International policy initiatives, such as the United Natons Framework Convention of Climate Change Reducing Emissions from Deforestation and forest Degradation (REDD) program (13), often lack the institutional investment and scientific capacity to begin implementation of a program that can make use of the global observational record; in other words, the policy is far ahead of operational capabilities (14). Brazil’s use of Landsat data in documenting trends in deforestation was crucial to its policy formulation and implementation. To date, only Brazil produces and shares spatially explicit information on annual forest extent and change. The maps and statistics we present can be used as an initial reference for a number of countries lacking such data, as a spur to capacity building in the establishment of national-scale forest extent and change maps, and as a basis of comparison in evolving national monitoring methods. Global-scale studies require systematic global image acquisitions available at low or no direct cost and the preprocessing of geometric and radiometric corrections of satellite imagery, exemplified by the Landsat program. Given such progressive data policies and image processing capabilities, it is now possible to use advanced computing systems, such as the Google cloud, to efficiently process and characterize global-scale time-series data sets in quantifying land change. There are several satellite systems in place or planned for collecting data with similar capabilities to Landsat. Similar free and open data policies would enable greater use of these data for public good and foster greater transparency of the development, implementation, and reactions to policy initiatives that affect the world’s forests. The information content of the presented data sets, which are publicly available, provides a transparent, sound, and consistent basis on which to quantify critical environmental issues, including (i) the proximate causes of the mapped forest disturbances (15); (ii) the carbon stocks and associated emissions of disturbed forest areas (16–18); (iii) the rates of growth and associated carbon stock gains for both managed and unmanaged forests (19); (iv) the status of remaining intact natural forests of the world and threats to biodiversity (20, 21); (v) the effectiveness of existing protected-area networks (22); (vi) the economic drivers of natural forest conversion to more intensive land uses (23); (vii) the relationships between forest dynamics and social welfare, health, and other relevant human dimensions data; (viii) forest dynamics associated with governance and policy actions—and many other regional-to-global–scale applications. J. A. Foley, R. Defries, G. P. Asner, C. Barford, G. Bonan, S. R. Carpenter, F. S. Chapin, M. T. Coe, G. C. Daily, H. K. Gibbs, J. H. Helkowski, T. Holloway, E. A. Howard, C. J. Kucharik, C. Monfreda, J. A. Patz, I. C. Prentice, N. Ramankutty, P. K. Snyder, Global consequences of land use. Science 309, 570–574 (2005). M. C. Hansen, S. V. Stehman, P. V. Potapov, Quantification of global gross forest cover loss. Proc. Natl. Acad. Sci. U.S.A. 107, 8650–8655 (2010). Food and Agricultural Organization of the United Nations, Global Forest Land-Use Change 1990-2005, FAO Forestry Paper No. 169 (Food and Agricultural Organization of the United Nations, Rome, 2012). M. Hansen, R. DeFries, Detecting long-term global forest change using continuous fields of tree-cover maps from 8-km Advanced Very High Resolution Radiometer (AVHRR) data for the years 1982-1999. Ecosystems 7, 695–716 (2004). Instituto Nacional de Pesquisas Especias, Monitoring of the Brazilian Amazonian Forest by Satellite, 2000-2012 (Instituto Nacional de Pesquisas Especias, San Jose dos Campos, Brazil, 2013). G. Sparovek, G. Berndes, A. G. O. P. Barretto, I. L. F. Klug, The revision of the Brazilian Forest Act: Increased deforestation or a historic leap towards balancing agricultural development and nature conservation. Environ. Sci. Policy 16, 65–72 (2012). D. P. Edwards, W. F. Laurance, Carbon emissions: Loophole in forest plan for Indonesia. Nature 477, 33 (2011). M. Drummond, T. Loveland, Land-use pressure and a transition to forest-cover loss in the Eastern United States. Bioscience 60, 286–298 (2010). W. A. Kurz, C. C. Dymond, G. Stinson, G. J. Rampley, E. T. Neilson, A. L. Carroll, T. Ebata, L. Safranyik, Mountain pine beetle and forest carbon feedback to climate change. Nature 452, 987–990 (2008). B. Gardiner et al., Destructive Storms in European Forests: Past and Forthcoming Impacts (European Forest Institute, Freiburg, Germany, 2010). P. Potapov, M. Hansen, S. Stehman, T. Loveland, K. Pittman, Combining MODIS and Landsat imagery to estimate and map boreal forest cover loss. Remote Sens. Environ. 112, 3708–3719 (2008). Prishchepov, D. Muller, M. Dubinin, M. Baumann, V. Radeloff, Determinants of agricultural land abandonment in post-Soviet European Russia. Land Use Policy 30, 873–884 (2013). United Nations Framework Convention on Climate Change, Reducing Emissions from Deforestation in Developing Countries: Approaches to Stimulate Action – Draft Conclusions Proposed by the President (United Nations Framework Convention on Climate Change Secretariat, Bonn, Germany, 2005). R. Houghton et al., The role of science in REDD. Carbon Manage. 1, 253–259. H. Geist, E. Lambin, Proximate causes and underlying driving forces of tropical deforestation. Bioscience 52, 143–150 (2002). S. S. Saatchi, N. L. Harris, S. Brown, M. Lefsky, E. T. Mitchard, W. Salas, B. R. Zutta, W. Buermann, S. L. Lewis, S. Hagen, S. Petrova, L. White, M. Silman, A. Morel, Benchmark map of forest carbon stocks in tropical regions across three continents. Proc. Natl. Acad. Sci. U.S.A. 108, 9899–9904 (2011). Baccini, S. J. Goetz, W. S. Walker, N. T. Laporte, M. Sun, D. Sulla-Menashe, J. Hackler, P. S. A. Beck, R. Dubayah, M. A. Friedl, S. Samanta, R. A. Houghton, Estimated carbon dioxide emissions from tropical deforestation improved by carbon-density maps. Nature Clim. Change 2, 182–185 (2012). N. L. Harris, S. Brown, S. C. Hagen, S. S. Saatchi, S. Petrova, W. Salas, M. C. Hansen, P. V. Potapov, A. Lotsch , Baseline map of carbon emissions from deforestation in tropical regions. Science 336, 1573–1576 (2012). R. Waterworth, G. Richards, C. Brack, D. Evans , A generalized hybrid process-empirical model for predicting plantation forest growth. For. Ecol. Manage. 238, 231–243 (2007). P. Potapov et al., Mapping the world’s intact forest landscapes by remote sensing. Ecol. Soc. 13, 51 (2008). T. M. Brooks, R. A. Mittermeier, G. A. da Fonseca, J. Gerlach, M. Hoffmann, J. F. Lamoreux, C. G. Mittermeier, J. D. Pilgrim, A. S. Rodrigues, Global biodiversity conservation priorities. Science 313, 58–61 (2006). S. Rodrigues, S. J. Andelman, M. I. Bakarr, L. Boitani, T. M. Brooks, R. M. Cowling, L. D. Fishpool, G. A. Da Fonseca, K. J. Gaston, M. Hoffmann, J. S. Long, P. A. Marquet, J. D. Pilgrim, R. L. Pressey, J. Schipper, W. Sechrest, S. N. Stuart, L. G. Underhill, R. W. Waller, M. E. Watts, X. Yan, Effectiveness of the global protected area network in representing species diversity. Nature 428, 640–643 (2004). T. Rudel, Is there a forest transition? Deforestation, reforestation and development. Rural Sociol. 63, 533–552 (1998). G. P. Asner, D. E. Knapp, E. N. Broadbent, P. J. Oliveira, M. Keller, J. N. Silva, Selective logging in the Brazilian Amazon. Science 310, 480–482 (2005). C. E. Woodcock, R. Allen, M. Anderson, A. Belward, R. Bindschadler, W. Cohen, F. Gao, S. N. Goward, D. Helder, E. Helmer, R. Nemani, L. Oreopoulos, J. Schott, P. S. Thenkabail, E. F. Vermote, J. Vogelmann, M. A. Wulder, R. Wynne, Free access to Landsat imagery. Science 320, 1011 (2008). C. Tucker, D. Grant, J. Dykstra, NASA’s orthorectified Landsat data set. Photogramm. Eng. Remote Sensing 70, 313–322 (2004). P. Potapov, S. A. Turubanova, M. C. Hansen, B. Adusei, M. Broich, A. Altstatt, L. Mane, C. O. Justice, Quantifying forest cover loss in Democratic Republic of the Congo, 2000-2010. Remote Sens. Environ. 122, 106–116 (2012). M. Broich, M. C. Hansen, P. Potapov, B. Adusei, E. Lindquist, S. V. Stehman, Time-series analysis of multi-resolution optical imagery for quantifying forest cover loss in Sumatra and Kalimantan, Indonesia. Int. J. Appl. Earth Obs 13, 277–291 (2011). M. Hansen, A. Egorov, D. P. Roy, P. Potapov, J. Ju, S. Turubanova, I. Kommareddy, T. R. Loveland, Continuous fields of land cover for the conterminous United States using Landsat data: First results from the Web-Enabled Landsat Data (WELD) project. Remote Sens. Letters 2, 279–288 (2011). M. Hansen, R. S. DeFries, J. R. G. Townshend, M. Carroll, C. Dimiceli, R. A. Sohlberg, Global percent tree cover at a spatial resolution of 500 meters: First results of the MODIS vegetation continuous fields algorithm. Earth Interact. 7, 1–15 (2003). L. Breiman, J. Friedman, R. Olsen, C. Stone, Classification and Regression Trees (Wadsworth and Brooks/Cole, Monterey, CA, 1984). C. Chambers, A. Raniwala, F. Perry, S. Adams, R. R. Henry, R. Bradshaw, N. Weizenbaum, FlumeJava: Easy, efficient data-parallel pipelines. ACM SIGPLAN Notices 45, 363–375 (2010). Food and Agricultural Organization of the United Nations, Global Forest Resources Assessment (Food and Agricultural Organization of the United Nations, Rome, 2010). A. Grainger, Difficulties in tracking the long-term global trend in tropical forest area. Proc. Natl. Acad. Sci. U.S.A. 105, 818–823 (2008). F. Achard, H. D. Eva, H. J. Stibig, P. Mayaux, J. Gallego, T. Richards, J. P. Malingreau, Determination of deforestation rates of the world’s humid tropical forests. Science 297, 999–1002 (2002). P. Gong, J. Wang, L. Yu, Y. Zhao, Y. Zhao, L. Liang, Z. Niu, X. Huang, H. Fu, S. Liu, C. Li, X. Li, W. Fu, C. Liu, Y. Xu, X. Wang, Q. Cheng, L. Hu, W. Yao, H. Zhang, P. Zhu, Z. Zhao, H. Zhang, Y. Zheng, L. Ji, Y. Zhang, H. Chen, A. Yan, J. Guo, L. Yu, L. Wang, X. Liu, T. Shi, M. Zhu, Y. Chen, G. Yang, P. Tang, B. Xu, C. Giri, N. Clinton, Z. Zhu, J. Chen, J. Chen, Finer resolution observation and monitoring of global land cover: First mapping results with Landsat TM and ETM+ data. Int. J. Remote Sens. 34, 2607–2654 (2013). J. Sexton et al., Global 30-m resolution continuous fields of tree cover: Landsat-based rescaling of MODIS Vegetation Continuous Fields with lidar-based estimates of error. Int. J. Digit. Earth 6, 427–448 (2013). G. Gutman, C. Huang, G. Chander, P. Noojipady, J. Masek, Assessment of the NASA-USGS Global Land Survey (GLS) datasets. Remote Sens. Environ. 134, 249–265 (2013). M. Hansen, P. Potapov, S. Turubanova, in Global Forest Monitoring from Earth Observation, F. Achard, M. Hansen, Eds. (CRC Press, Boca Raton, FL, 2012), 93–109. S. Goetz, R. Dubayah, Advances in remote sensing technology and implications for measuring and monitoring forest carbon stocks and change. Carbon Manage. 2, 231–244 (2011). Acknowledgments: Support for Landsat data analysis and characterization was provided by the Gordon and Betty Moore Foundation, the United States Geological Survey, and Google, Inc. GLAS data analysis was supported by the David and Lucile Packard Foundation. Development of all methods was supported by NASA through its Land Cover and Land Use Change, Terrestrial Ecology, Applied Sciences, and MEaSUREs programs (grants NNH05ZDA001N, NNH07ZDA001N, NNX12AB43G, NNX12AC78G, NNX08AP33A, and NNG06GD95G) and by the U.S. Agency for International Development through its CARPE program. Any use of trade, firm, or product names is for descriptive purposes only and does not imply endorsement by the U.S. government. Results are depicted and viewable online at full resolution: http://earthenginepartners.appspot.com/science-2013-global-forest.